In this exciting webinar Miguel will draw from his own firsthand experience of the Mediterranean diet, as well as from his recent research experience on neuroprotection working on mitochondrial gene expression with neural stem cells at the University of Roehampton as part of his MSc in Clinical Neuroscience. He will translate the benefits of a Mediterranean-style diet into an evidence-based model for brain protection and cognitive enhancement that includes both foods and multiple food supplements. BANT was interested to see today’s news about eating 10 pieces of fruit or veg everyday, and how most people would find it difficult to fit this recommendation into their diet. Whilst this may be true for some, it is clear that the “5-a-day” government-issued guidelines are out of date. The 2015 BANT ‘Wellbeing Guidelines’ provided the recommendation that seven portions of vegetables and fruit should be eaten daily to support health. They were designed to generally encourage people to eat more fruit and vegetables. According to a review of 95 studies published in the International Journal of Epidemiology in 2017, those eating 7 portions of fruit and vegetables a day experienced a lower risk of cancer or heart attacks. Researchers found that vegetables contributed to decreased risk more strongly than fruit and that cruciferous vegetables (cabbage, broccoli etc.) provided the most benefits. 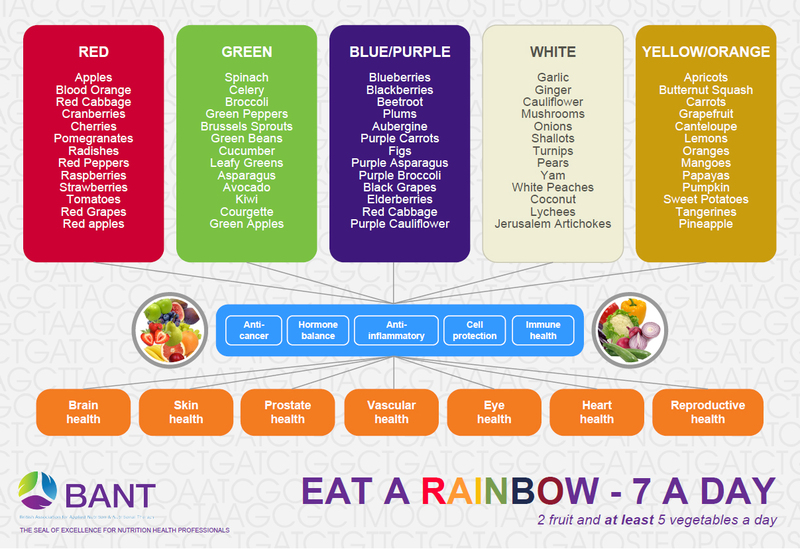 BANT would like to highlight that eating more vegetables of different colours (Eating a Rainbow) is key to a healthy diet (Oyebode et al., 2014) and BANT practitioners generally recommend eating a higher proportion of vegetables to fruit when meeting the daily target, to limit sugar intake. It is important to note that fructose is also sugar and has been widely linked to obesity and type 2 diabetes. On a daily target of seven vegetables and fruit BANT, therefore, recommends two portions of fruit per day (and only one if the goal is weight loss). BANT does not suggest a limit on vegetable and salad intake, although a minimum of five portions is recommended and fresh is recommended over frozen and canned fruit consumption. A final reminder about the free BANT Student Webinar this Thursday evening, get clued up about the mechanisms behind gaining weight and carbohydrate metabolism with a fabulous book, sign up to BioNutri’s intriguing seminars, and book your place at the BANT AGM next month. Our next BANT Student Network Webinar is with Michelle Barrow this Thursday 23rd February, from 7.30 – 8.30pm. It is free and exclusive to BANT student members. Michelle will be discussing ‘Evidence-based practice vs. Personalised practice’, specifically the strengths, limitations and ethical consideration of these methods of informing nutrition practice. Not one to be missed, especially for those students among us who are soon to be graduates. Click here to book your place or e-mail Alma or Becky at studentwebinars@bant.org.uk. This informative book by obesity expert, Zoe Harcombe, is a must-read for students. In it, she spells out in detail why the decades old theory of ‘energy in vs. energy out’ for weight loss is fundamentally flawed, by painstakingly dissecting the evidence. Now, this could be a very difficult, turgid read. But it is not – she writes brilliantly, and in such a way that you come away understanding the analysis, arguments and biochemistry without realising. An invaluable book, it is helpful from a critical analysis perspective, too. The book costs £20 new from Amazon – here is the link to buy it. Definitely money well spent! BANT’s 2017 AGM takes place on 18th March at the Cavendish Conference Centre in London, from 9.30am until 11.30am, and is free. It is the ideal opportunity to find out more how BANT works, especially if you are interested in becoming a volunteer yourself. To book, visit this page. Exciting New Projects and Volunteering Roles Announced! What are your goals this year? If so, volunteering for BANT might be the answer. BANT also has a whole bunch of ambitious objectives this year, designed to support and benefit our members. As a member of BANT you may have the skills and abilities we need to help these become a reality. Welcome to the February edition of the BANT ENews. In this month’s issue our fascinating feature article and video of the month both discuss the positive side of Helminths (intestinal worms). Emma Hendricks our Centre of Excellence Manager gives us her ‘Day in the Life’; Miguel Toribio Mateas discusses the AXA/Penny Brohn initiative and we have the full detail from our Annual Member Survey. The weather is bad outside, the perfect weather for curling up in a chair and catching up on all the BANT news. Access the BANT news here. Welcome to the February edition of the BANT ENews. In this month’s issue our fascinating feature article and video of the month both discuss the positive side of Helminths (intestinal worms). Emma Hendricks our Centre of Excellence Manager gives us her ‘Day in the Life’; Miguel Toribio Mateas discusses the AXA/Penny Brohn initiative and we have the full detail from our Annual Member Survey. The weather is bad outside, the perfect weather for curling up in a chair and catching up on all the BANT news. BANT is relaunching its successful member webinar programme for 2017 with eminent functional medicine and nutritional science speakers including Dr. Grisanti and Dr Miguel Toribio-Mateas amongst others. Dr. Grisanti has kindly created a short welcome video to launch our 2017 webinar programme and this can be view here. Each month’s webinars will be published on the BANT website under the Centre of Excellence (orange section) at this link on the last day of every month, so keep an eye on social media – Facebook Members or LinkedIn for information and news. You can also access webinars from years prior to 2017 at this link. Please note that the webinars are CPD approved and will be listed in the dropdown selection when you add the webinar to you online CPD log. Our first webinar of year is now available. Provided by the Functional Medicine University the webinar is entitled ‘The Triage Theory: It All Starts with Individual Nutritional Optimisation’. It is a fascinating insight into the Triage Theory, the concept that when nutrients are scarce, the body will triage which nutrients are most important for survival today, risking health into later years of life. The webinar is presented by Kirstin Keilty MS, CNS. To access the webinar, click here. BANT was disappointed by the Scientific Advisory Committee on Nutrition’s (SACN) recommendation to Public Health England (PHE) that vitamin D supplementation could only be recommended for bone and muscle health, despite all the scientific evidence to the contrary. Did SACN not find any correlations because of its own criteria? “Clinical advice to high risk women (obesity, darker skinned, reduced exposure to sunlight) is outside SACN’s remit”. BANT feels that ignoring thousands of studies, including genetic and epidemiological studies that have linked vitamin D deficiency with the development of autoimmune disease and other conditions, is a missed opportunity and questions how PHE plans to measure the damage done to those who are not benefiting from appropriate governmental advice. BANT Chairman Miguel Toribio-Mateas said: “Vitamin D has traditionally been known for its role in bone metabolism, but emerging evidence suggests a much broader role for vitamin D in immune regulation. In fact, vitamin D deficiency has been associated as a contributor to the pathogenesis and severity of diverse autoimmune disorders, from autoimmune bowel conditions like coeliac disease to rheumatoid arthritis, lupus, and multiple sclerosis; some of the main reasons individuals seek dietary advice from our members. There is consistent scientific evidence that in some people with variants in vitamin D metabolism and vitamin D-receptor genes, their ability to convert vitamin D into a usable form is compromised, meaning that these individuals may remain deficient despite supplementation. Therefore, knowing about these genetic variants would allow an appropriately trained practitioner to recommend a vitamin D protocol that is tailored to these individuals’ needs. As shown in clinical trials conducted in a variety of countries around the world, a simple blood test that measures serum 25-hydroxyvitamin D confirms that even when vitamin D is supplemented at modest levels, like the 10μg (400IU) proposed by Public Health England, some people will continue to have inadequate vitamin D levels. Additionally, some of the foods that are traditionally fortified with vitamin D, like flour made from milled cereals, used for bread-making and in most commercially available breakfast cereals, are also associated with higher levels of diet-driven inflammation, known as Dietary Inflammatory Index, and may not be suitable for all, further contributing to lack of vitamin D intake from dietary sources. Where can you find sources of vitamin D? Vitamin D is a fat-soluble vitamin whose primary source is sunlight. Very few foods contain vitamin D, hence the recommendation for supplementation. Food sources of vitamin D include sardines, cod liver (available as a pate that can be used as a savoury spread), tinned tuna, liver, eggs. However, please note that food sources are notoriously poor. With regards to fortified foods (the equivalent of taking a supplement that’s been added to your food) like orange juice and breakfast cereals, BANT considers that these may be useful for those individuals who are not able to eat any other sources of vitamin D or to supplement, but strongly advises all to read the labels and check for sugar content, both natural sugars and added (sucrose and fructose in many cases) as well as other undesirable ingredients. Vitamin D comes in two forms: D2 (ergocalciferol) and D3 (cholecalciferol). Vitamin D2 is manufactured by the UV irradiation of ergosterol in yeast, and vitamin D3 is made by the irradiation of 7-dehydrocholesterol from lanolin and the chemical conversion of cholesterol. Both forms have been regarded as equivalent, based on their ability to combat rickets and, indeed, most steps involved in the metabolism and actions of both forms are identical, and both forms effectively raise serum 25(OH)D levels. However, studies have shown that high doses of Vitamin D2 are less potent and therefore BANT recommends supplementing with Vitamin D3. RNT’s are able to provide individualised recommendations. BANT registered practitioners are insured to recommend supplements where needed. This is after thorough assessment based on clinical practice framework, which takes into account test results. BANT Registered Nutritional Therapists are uniquely trained to prescribe food supplements with caution, assess supplement quality, know supplement interactions with medications and appropriate dosing for the individual client. BANT Registered Nutritional Therapists take into account individuality that enables personalisation of dietary advice based on the most up-to-date research available. They do not endorse or promote ‘one-size-fits-all’ advice following the health trend of the moment. Barry, E. L., Rees, J. R., Peacock, J. L., Mott, L. A., Amos, C. I., Bostick, R. M., Figueiredo, J. C., Ahnen, D. J., Bresalier, R. S., Burke, C. A. & Baron, J. A. (2014) Genetic variants in CYP2R1, CYP24A1, and VDR modify the efficacy of vitamin D3 supplementation for increasing serum 25-hydroxyvitamin D levels in a randomized controlled trial. J Clin Endocrinol Metab, 99(10) pp. E2133-7. Cantorna, M. T., Mcdaniel, K., Bora, S., Chen, J. & James, J. (2014) Vitamin D, immune regulation, the microbiota, and inflammatory bowel disease. Exp Biol Med (Maywood), 239(11) pp. 1524-30. Chowdhury, R., Kunutsor, S., Vitezova, A., Oliver-Williams, C., Chowdhury, S., Kiefte-De-Jong, J. C., Khan, H., Baena, C. P., Prabhakaran, D., Hoshen, M. B., Feldman, B. S., Pan, A., Johnson, L., Crowe, F., Hu, F. B. & Franco, O. H. (2014) Vitamin D and risk of cause specific death: systematic review and meta-analysis of observational cohort and randomised intervention studies. Bmj, g1903. Delvin, E., Souberbielle, J. C., Viard, J. P. & Salle, B. (2014) Role of vitamin D in acquired immune and autoimmune diseases. Crit Rev Clin Lab Sci,51(4) pp. 232-47. De Medeiros Cavalcante, I. G., Silva, A. S., Costa, M. J., Persuhn, D. C., Issa, C. T., De Luna Freire, T. L. & Da Conceicao Rodrigues Goncalves, M. (2015) Effect of vitamin D3 supplementation and influence of BsmI polymorphism of the VDR gene of the inflammatory profile and oxidative stress in elderly women with vitamin D insufficiency: Vitamin D3 megadose reduces inflammatory markers. Exp Gerontol, 10-6. Liu, Z., Liu, L., Chen, X., He, W. & Yu, X. (2014) Associations study of vitamin D receptor gene polymorphisms with diabetic microvascular complications: a meta-analysis. Gene, 546(1) pp. 6-10. National Institutes of Health of the United States of America (2016) Vitamin D Factsheet for Health Professionals. https://ods.od.nih.gov/factsheets/VitaminD-HealthProfessional/#en2. Accessed online Thursday 21st July 2016. Romagnoli E, Pepe J, Piemonte S, Cipriani C, Minisola S (2013) Management of endocrine disease: value and limitations of assessing vitamin D nutritional status and advised levels of vitamin D supplementation. European Journal of Endocrinology. 169: R59-69. Shivappa, N., Hebert, J. R., Rosato, V., Rossi, M., Montella, M., Serraino, D. & La Vecchia, C. (2016) Dietary inflammatory index and ovarian cancer risk in a large Italian case-control study. Cancer Causes Control, 27(7) pp. 897-906. BANT Council encourages any members who have not yet already done so to sign the Fight the Fads petition for protection of title ‘Nutritionist’. The public deserve to know that practitioners are properly regulated and protection of title is one way to ensure that. Previously the Health & Care Professions Council have encouraged Nutrition Society, BDA and BANT to work together to protect the public. As highlighted in today’s Daily Mail, the British Association for Applied Nutrition and Nutritional Therapy (BANT) is proud that its registered practitioners have been chosen to work with Professor Tim Spector and his team as part of the “Map My Gut” gut microbiome sequencing service. Unlike other nutrition based professions, BANT registered practitioners have functional testing as part of their core curriculum clinical training and are, therefore, ideally placed to assess the Map My Gut test results and provide individualised recommendations to optimise a client’s health. Map My Gut is a unique lifetime health management company providing in-depth personalised microbiome analysis examining links between our health and the many bacteria living in our guts. As well as personalised testing the company also performs research into healthy foods and diets and advise the health food industry. The human microbe community (microbiome) plays a key role in our health and is vital for digestion, vitamin production and regulation of our immune system and even our mood and appetite. As a result, understanding how the bacteria living in your gut affects you and what you can do to increase its diversity is vital for wellbeing. This innovative and forward-thinking screening programme is the brainchild of Professor Tim Spector co-founder of the British Gut project, Dr Alessandra Cervino, an expert in the field of genetics and microbes and Jeff Leach co-founder of the American Gut project.